Princessly Polished: Giveaway: Too Faced Goodie Bag!! I decided it's time for another giveaway! 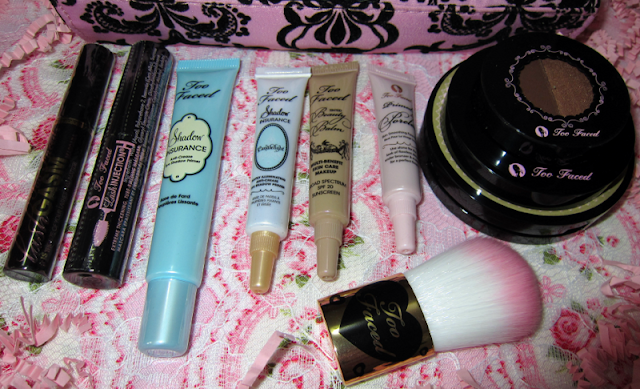 This time I have an assortment of some my favorite (and everyone else's) Too Faced products!! This will probably be the last giveaway I have time to do for awhile since I'm busy with planning my wedding, so I wanted to make it something special and glamorous! All items are 100% new and obtained by myself! This giveaway will be running until April 15th, 2012. You will get proof of mailing and will be sent by International Priority mail (generally takes 1-2 weeks). If you buy something from my Blog Sale, I will send your prize along with those items. Or, if you know someone living within the United States or US Territories I will happily mail to them! Huge thanks to all the International entrants in my past giveaways - you have been wonderful about this! Hi! What a great give away - also just letting you know you have two different dates about your give away going one saying March 10 and another April 15th! Congratulations on your upcoming wedding - very sweet of you to do while you are in the throes of planning your wedding! Great giveaway! OMG love love love all the goodies! Oops, I replied to your comment last night but it didn't go through - sorry! Thank you so much for all the great feedback and welcome to the blog, it's wonderful to have you here! I'm glad to hear that you like it. What a wonderful giveaway, thank you for hosting. I've never tried Too Faces products before, so I'd be stoked to win this. Ahh, I can see how you would be! Thanks for entering! Amazing giveaway, this is so generous of you and I more than understand about the shipping! 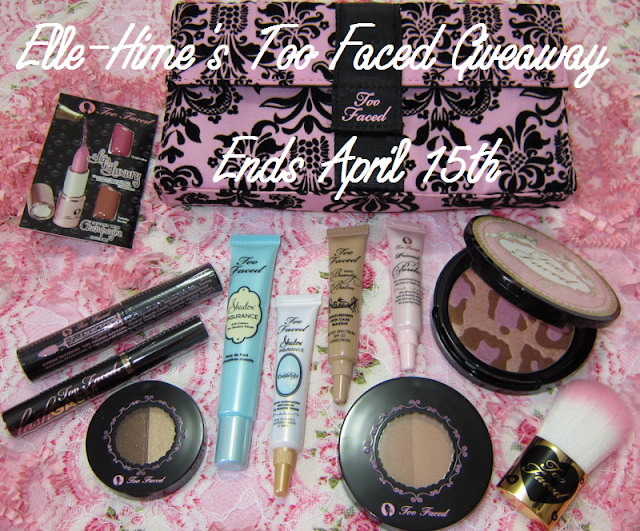 I've never tried any Too Faced products so I'd love to win :) Good luck ladies!! I love it! It's amazing! I don't think there has ever been a giveaway I wanted to win more. Thank you! Hey, great giveaway! I want to add you on GFC but I'm new to it and don't see a widget on your site...how do I connect with you on GFC without the widget?! Sorry to be annoying! Thanks for the giveaway Rochelle! Up in my right-hand sidebar the GFC widget should be the second box down. Occasionally it will glitch so it might appear if you try refreshing? You're welcome, thanks for the follow! payday loans we've worked challenging to partner track of the right companies to acquire the most effective, fastest payday cash advances online veteran small business loans.